If you are new to my blog, I have started to interview Small Business in the West of Ireland, to give them a chance to do their story and show the world their business. My last interview was with Ruairi Devlin, Founder of Micro Biz Awards, my second interview was with Jackie Queally from Earthwise, and my first interview was with Philip Gleeson from Quickest Fox Marketing. I am a very strong believer in the power of Social Media, so to give each small business as much exposure as possible, please share, tweet, comment, it will help to elevate their presence and help them grow! Today I am interviewing Dave Slaat from the Dutch Bakery Ireland. I came across the Facebook page of The Dutch Bakery Ireland, via another Facebook page of Irish and Belgian people in Ireland. So I thought, I’d interview Dave Slaat, to find out a bit more about his baking efforts in Co. Sligo. I can’t wait to try his sample box of Dutch bakery products… time to switch on the kettle and try all those delights!! Tell us a bit about yourself & where you are located in the West of Ireland. Hello, my name is Dave Slaat, I was born in the Netherlands, and moved to Ireland in 2007. I started working at a riding center in Galway as a housekeeper. It was great fun to work with so many different people, and working with horses, but unfortunate I was let go after one and a half year and moved to Sligo. In Co. Sligo I started a home bakery with my ex partner, and traveled through the West of Ireland, to sell our products at different festivals, this was a great experience, to meet new people, and to see how the Irish community would react to Dutch/German pastries. How long have you been in business? In this business? In other businesses?How did you get started in this business? For a year we had a Cake shop in Ballisodare, called Apollonia’s Cake shop, which was a great success. But too much pressure and a newborn baby made it too difficult to keep going, so in good harmony we decided to go separate ways. I was determined to keep going with the business, and that was actually the first time I started baking myself. With great success, it turned out I found a new passion, So in 2011 I registered my business as The Dutch bakery. 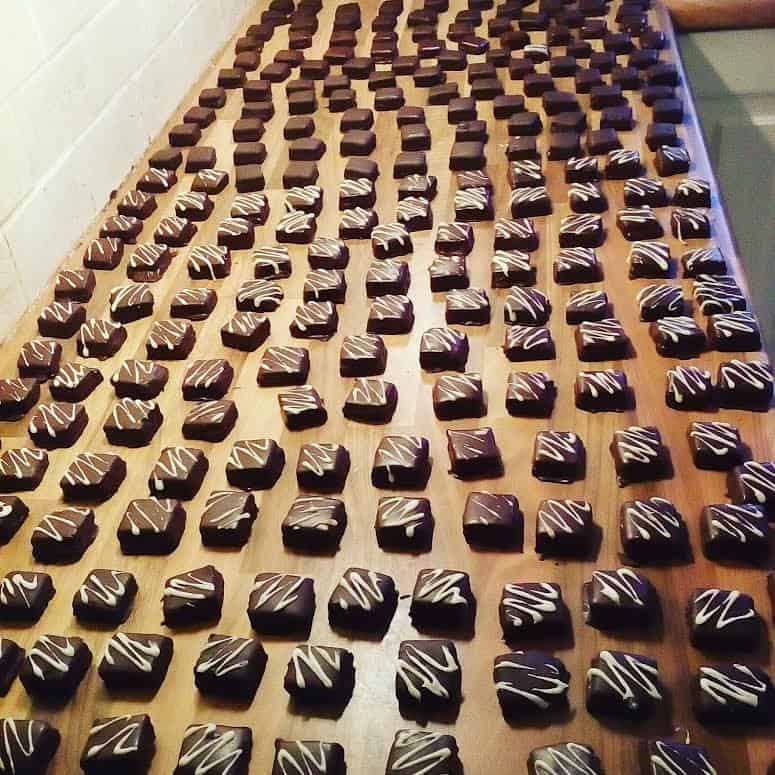 Currently I have my own Home Bakery at Dromore West, and started making handmade chocolates 1.5 years ago, the reason was it was too difficult to compete against local Irish home producers, and I wanted to do something new..I started selling my handmade chocolates in the local shop, with great success, because before I knew it, I was selling over 50 cakes in one week, and like 1000 bags of chocolates in 1.5 month…Last year I took a break from everything, and started working full- time at a local restaurant…but I missed my own business too much, and started making the chocolates again last year November. So it’s just since a few weeks I’m running a full time job again with my business, I launched my Facebook page as The Dutch Bakery Ireland, with great response, I even had to search for people to help me out…. Funny thing is, up to last week I was doing everything alone, planning, ordering, answering e mails, and then of course also baking…I booked a ticket for a very good friend of mine to come on holidays and it turned out to be such a gift, my friend loves helping out, and when the Facebook account was launched, he helped a lot with giving feedback and so on..turns out he’s a very talented confectioner as well, and is planning now to come over permanently to run the business with me. Having opened my Facebook page has been the best thing I have done, so I can show my existing and future clients what I am baking. Most of my customers are Dutch people that live in Ireland. 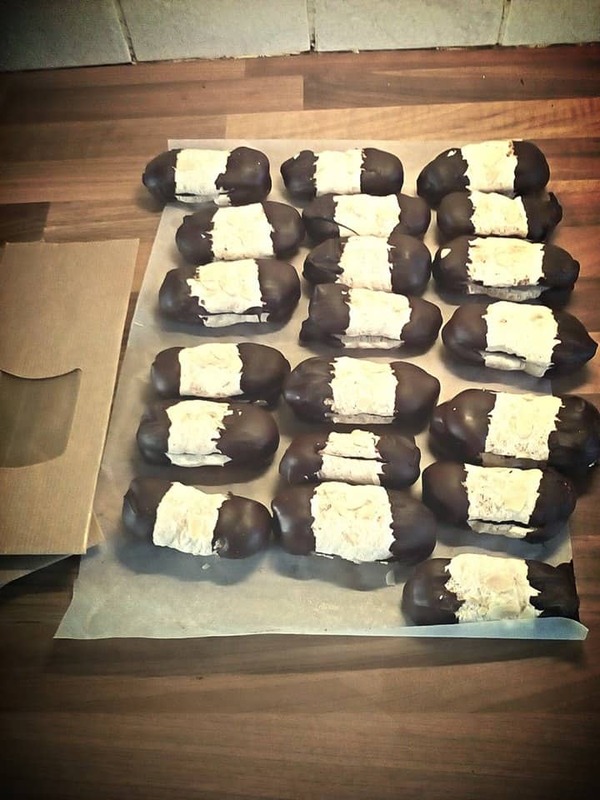 I got so much positive feedback, I never realized how much they would miss some Dutch sweets and cakes, like the bokkenpoten ( biscuits that resemble the leg of goat, delicious traditional Dutch almond meringue cookies filled with butter icing and dipped in chocolate. ( See picture), gevulde koek ( gevulde koek is an almond cookie made of dough and butter with a sweet filling. Almond paste is the most common filler. An almond cookie with a diameter of about 10 cm, a half almond on top. The top of the cake is shiny brown, an effect that is achieved through to cover the dough with beaten egg. and vlaaien ( flans). The difficulty of running my business is, time, your always short in time, and it takes a lot money to start a business. Sometimes I had to choose between buying ingredients, to keep the business going, or to pay my rent. I think this year will be very challenging, because I don’t have the funding to the the things I want yet, very frustrating, because there is a lot demand for traditional Dutch cakes. What keeps me going when things are down is, the dream of having my own business. Baking is my passion, and I’ve learned from the past, it’s never perfect, you never get things the way you wan. If only just one person is very happy with my box filled with goodies, can make the whole difference between a bad day and good day. 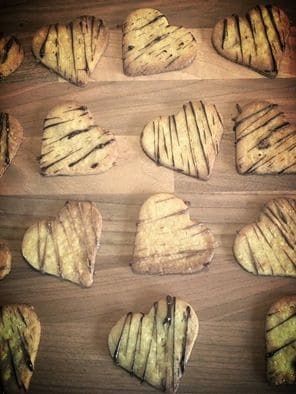 My plan for 216 is to move house in June, I need a bigger premise for the baking, and would love to have a lot people coming over for a working holiday, so good accommodation is essential.I would love to be able to deliver my products in Dublin, so saving up for a small van, is priority now. You have started to ship parcels with a variety of Dutch bakery products. What’s in the Box, and what does it cost and how can a reader get their hands on them! First of all, thank you very much to give me the opportunity to tell your readers about my small but growing business. It’s great to look back what I have done so far, and it makes me feel very proud to see what I have achieved so far..
Just a quick reminder, Please share this interview, as I’d like to start a small movement to highlight the brilliant businesses in the West of Ireland! My next interview will be with Sandra King from http://www.Meetthewool.com in Co. Clare! If you would like to be interviewed, please drop me an email to katleen@workinglivingtravellinginireland.com and I’ll be in touch.